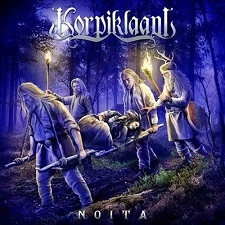 Noita is the ninth studio album from Korpiklaani, a folk metal band from Lahti, Finland. It is the follow-up to 2012's Manala. While Manala was a much darker and heavier period for the band, Korpiklaani, which means "Forest Clan", still creates a unique style that is as very much metal as it is folk with Noita. Noita is the Finnish word for "witch", but it also translates to "shaman" or "medicine man". This makes more sense, because Korpiklaani went by the name Shaman until 2003. Finnish and English versions of Manala were released, but Noita is all Finnish as of right now. Noita starts off with "Viinamäen Mies" ("The Vineyard Man"). It is heavy on the accordion, but the underlying hard rock guitar riffs are still prominent. The bulk of the lyrics are in Finnish, but there is this noticeable and memorable chant of "hey hey hey!" that hooks you in. Jonne Järvelä's vocals lean more to a metal style than a folk style on this song. He has just the right amount of growl in his voice. The general mood of this song makes me want to drink beer and break things and be a Viking. "Viinamäen Mies" wins as an album opener. "Lempo" is a spirited track about the god of love from Finnish mythology. The beginning sounds like something out of a Manowar song, except with a violin and an accordion. There is a fascinating tribal feel to Matti Johansson's drumming, especially in the first part. The metal elements on this one are heavier than on the first track, and Tuomas Rounakari's violin work is astounding. "Lempo" is catchy as hell, even though I have no clue what Jonne Järvelä is singing. "Sahti", a song that seems to be about beer, and "Luontoni" ("My Nature") combine thrash metal-inspired riffs and speed with the accordion and violin to create extremely lively and rousing pieces. These contrast with "Minä Näin Vedessa Neidon" ("I Saw a Mermaid in the Water"), a much slower and darker song with a lengthy and involved violin solo. One really unexpected moment from Noita was "Jouni Jouni." I listened to the album two or three times without fully realizing what it was. I kept thinking, "This sounds familiar. I know it does." Then, when I was translating the song titles to get a feel for what the songs were about, this title didn't translate because it happened to be a name. Upon further research, I learned that it was a cover of the Tommy James & The Shondells classic "Mony Mony"--only fully translated into Finnish and with the name changed to something a little more culturally relevant to a Finnish band. The choruses of the two versions sound pretty different, but the verses seem to match up pretty well once it all clicks. I really like this one, and it's much heavier and more creative than the Billy Idol cover we all grew up with. "Ämmänhauta" is my favourite track from Noita along with "Lempo." It features a great balance of heavy metal guitar riffs mixed with the violin. Jonne Järvelä's vocals on this one are a little closer to the traditional "yoik" style of folk singing, but they're still a lot grittier. The lyrics have a certain cadence to them, and combined with the overall big sound, this makes "Ämmänhauta" so captivating. Noita ends with "Sen Verran Minäkin Noita" ("It's a Shaman Too"). You can really hear a lot of classic/NWOBHM influence on this one. The galloping Iron Maiden-esque riffs in the intro caught me off guard, and they do carry over into other parts of the song. Jonne Järvelä sings the song's title in his lower register during the chorus, and it is rather dark and creepy. Finishing out the song in a unique fashion, violin and accordion solos from Tuomas Rounakari and Sami Perttula, respectively, fill what is normally the role of a guitar solo in a metal song. Korpiklaani's Noita is filled with more than its fair share of memorable tracks. The band's style of mixing fast, heavy, and thrashing metal with traditional European folk music styles is intriguing, and Korpiklaani does it perfectly. Despite the fact that the lyrics are in Finnish, I am still able to connect with each of these songs on a certain level because of the band's intensity and great ability to convey their live energy onto a record. Noita is a remarkable album, and it certainly speaks volumes for the power of art and music to transcend language barriers while proving that metal may be a universal language.